For instance, right now in HTML it appears to produce two spaces per press of TAB, but in TypeScript it produces 4. By default, Visual Studio Code will try to guess your indentation options depending on the file you open. You can turn off indentation guessing via "editor.detectIndentation": false. // based on the file contents when `editor.detectIndentation` is true. // the values you've explicitly set, above. I'm running version 1.21 but I think this may apply to earlier versions as well. Take a look at the bottom right-hand side of the screen. You should see something that says Spaces or Tab-Size. Select the amount of spaces or tabs you like. This only works per document, not project-wide. If you want to apply it project-wide, you need to also add "editor.detectIndentation": false to your user settings. By default, Visual Studio Code auto-detects the indentation of the current open file. If you want to switch this feature off and make all indentation, for example, two spaces, you'd do the following in your User Settings or Workspace settings. We can control tab size by file type with EditorConfig and its Visual Studio Code extension. We then can make Alt + Shift + F specific to each file type. EditorConfig overrides whatever settings.json configures for the editor. There is no need to change editor.detectIndentation. You want to make sure your editorconfig is not conflicting with your user or workspace settings configuration, as I just had a bit of annoyance thinking the settings files settings were not being applied when it was my editor configuration undoing those changes. That is lonefy.vscode-js-css-html-formatter to blame. Disable it, and install HookyQR.beautify. Now on save your tabs wouldn't be converted. I had EditorConfig for Visual Studio Code installed in my editor, and it kept overriding my user settings which were set to indent files using spaces. Every time I switched between editor tabs, my file would automatically get indented with tabs even if I had converted indentation to spaces!!! Right after I uninstalled this extension, indentation no longer changes between switching editor tabs, and I can work more comfortably rather than having to manually convert tabs to spaces every time I switch files - that is painful. @alex-dima's solution from 2015 will change tab sizes and spaces for all files and @Tricky's solution from 2016 appears to only change the settings for the current file. As of 2017, I found another solution that works on a per-language basis. Visual Studio Code was not using the proper tab sizes or space settings for Elixir, so I found that I could change the settings for all Elixir files. I clicked on the language in the status bar ("Elixir" in my case), chose "Configure 'Elixir' language based settings...", and edited the Elixir-specific language settings. I just copied the "editor.tabSize" and "editor.insertSpaces" settings from the default settings on the left (I'm so glad those are shown) and then modified them on the right. It worked great, and now all Elixir language files use the proper tab size and space settings. then right click your document if you have one opened already and click Format Document to have your existing document follow these new settings. When using TypeScript, the default tab width is always two regardless of what it says in the toolbar. You have to set "prettier.tabWidth" in your user settings to change it. User3550138 is correct. lonefy.vscode-js-css-html-formatter overrides all the settings mentioned in other answers. However, you don't have to disable or uninstall it as it can be configured. 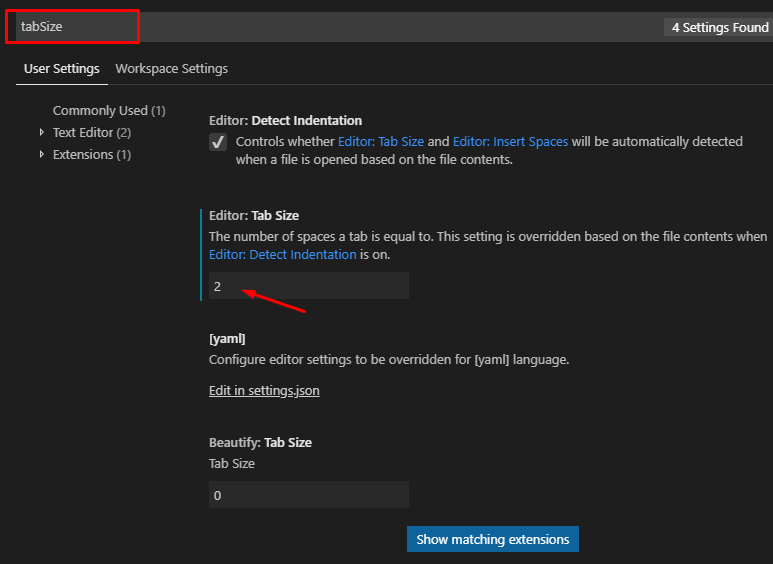 Full instructions can be found by opening the extensions sidebar and clicking on this extension and it will display configuration instructions in the editor workspace. At least it does for me in Visual Studio Code version 1.14.1. Not massively recommended as an npm update will delete your work, but it has saved me a lot of time. How to set per-filetype tab size? How to select tab-size in Visual Code Studio for pug lang? How can I configure wrapping indent size in VS Code?